Happy Monday to you! Am I weird??? I love Mondays! It just seems like a new start every week. And I seem to need a new start every week! Things are getting interesting around here. I won't bore you with details, but I think we may be moving before long. We have been thinking about moving from Tulsa to the OKC area to be closer to the kids, particularly Cameron (7 yr. old grandson). We've found a possible house so we'll see how it plays out. The great thing about it is that wherever I go, I can take you with me!! 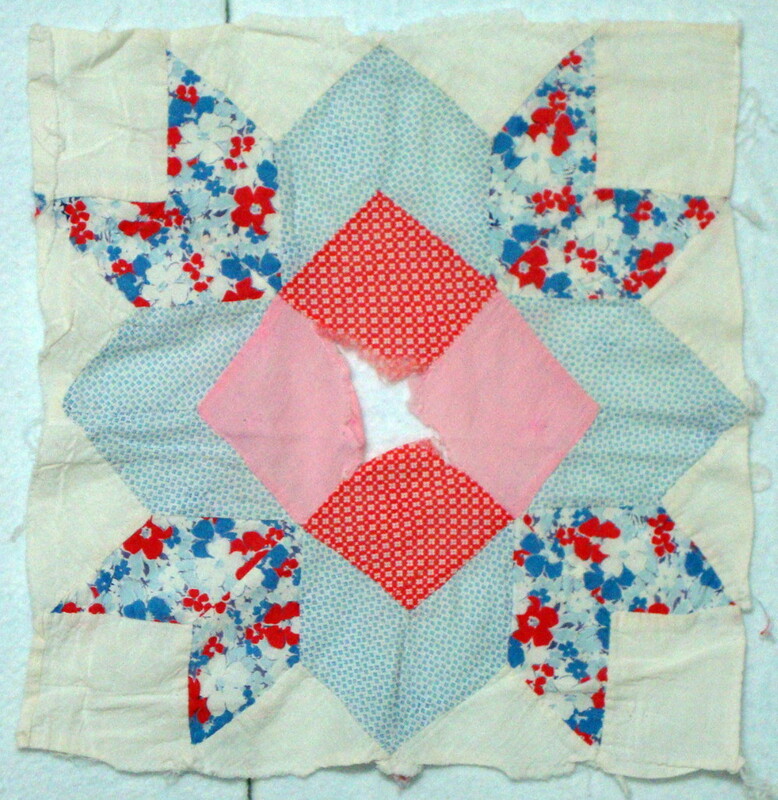 I took four of these blocks, removed the 4-patch in the center and replaced it with a solid white fabric similar to the white in the blocks. 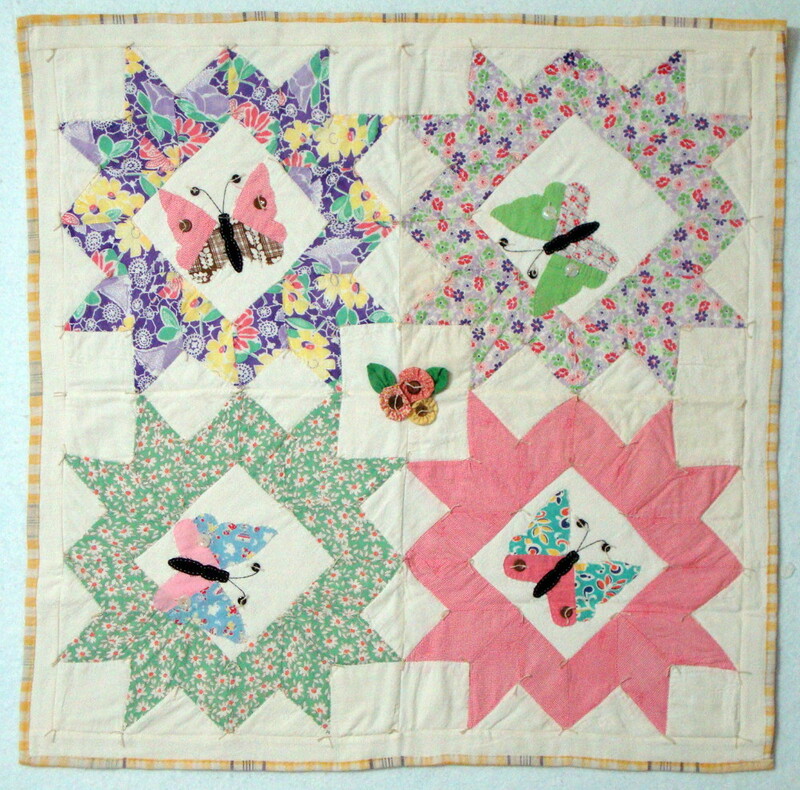 I then sewed the four patches together securely and used that piece for my Butterflies. 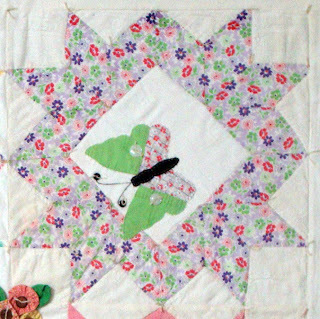 By placing my butterfly template carefully on the 4-patch, I can have 2 colored butterflies in any arrangement that I like! Much more interesting to my eyes than a single fabric butterfly. Then, of course, there are buttons and other items used for embellishment. It's tied with feedsack string. 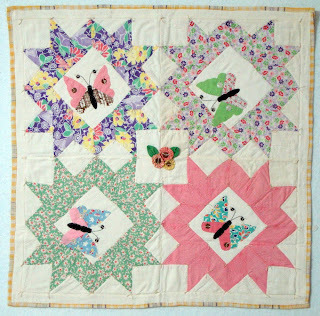 I hadn't looked at this quilt in a long time, and I think I would like to add more fun stuff to it! 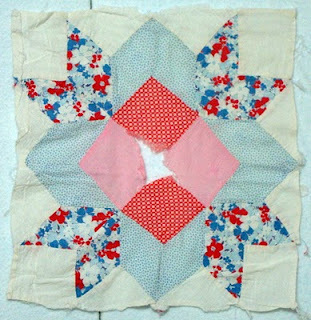 I then used an old plaid tablecloth for the backing and wrapped it to the front to finish the edges. I generally add some hand quilting around the edges of the appliques to maintain the vintage look. I really miss doing this type of 'art' quilt! I have so many ideas in my mind, I can hardly stand it. As I said, this is where my heart lies and I hope you don't mind seeing more of these projects from time to time. I would love to hear ideas you might have for using old things if you have a chance!